Been clearing up old files on my PC and found photos of breads I baked ages ago and had comletely forgotten about….. One of them was Tartine’s Basic Country Bread. Ever since I read Shiao-Ping’s blog about her ‘imitation of Chad Robertson’s Country Sourdough’ and all the buzz following the publication of ‘Tartine Bread’ last year, I’d been so intrigued to find out how wonderful its famous bread. Thought of buying a book, but didn’t in the end after reading many reviews and contemplating for a long time. It was very interesting to read Eric’s view on the book he posted a while ago, because that was exactly what I’d thought the book might be like and the reason why I decided not to buy. Didn’t follow its method of ‘how to start the levain’ but I just fed my starter with 50:50 = WW : Strong with hydration of 75%, as my regular starter, and increased the ratio of pre-ferment to a bit over 30%. Here’s my formula for my take. Mix all of the levain with main dough flours and water until shaggy mess. Autolyse for 30 – 40 minutes. Sprinkle the salt over the dough and S & F in the bowl until the salt is evenly distribute. Rest for 40- 45 minutes. Repeat S & F in the bowl every 35 – 40 minutes over next 3 hrs until the dough increases the volume by 30% or so. Pre-shape and rest for 20 minutes. Shape and cold retard overnight. Pre-heat the oven to 240C with a Pyrex with lid or a cast iron/Dutch oven in it. Bake at 240C for 20 minutes in a covered Pyrex (or similar). After 20 minutes, remove the cover, lower the temperature to 200C, and bake for another 20 minutes. Verdict : Not too sure……:p It was pleasant tasting bread with quite well balanced, gentle flavour, for sure. I can see why a lot of people like this as the daily basic bread, but tbh it was too gentle and lacked complexity of flavour I’m used to from other breads I bake regularly, I thought. It was good bread, but to be entirely honest, I didn’t find it was that sensational. Which is actually very similar thing I’d found from Hamelman’s Pain au Levain (::gasps:: BLASPHEMY!!!!) ; another bread which is very popular, but the one I only baked a few times. I did not follow CR’s formula to a tee, so it’s quite possible I’m missing something here, I must admit. OK….I’m open to anyone telling me off!!! I'm well aware of the high standards you always demand from your own bread. Your version of the loaf looks stunning to me. Shiao-Pings original post is now quite old, and used the method described in the Bread Builders book from Wing and Scott. I don't own Robertson's book either, but I wonder how similar his formulae are in his own book to the one published by Dan Wing? If you fid the flavour lacking, I suspect the best course for action woul either be to ripen your leaven more, or, increase the portion of pre-fermented flour. 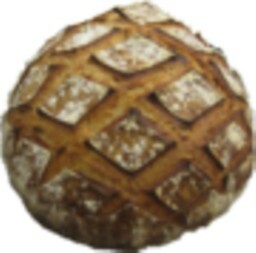 From all the great post on TFL which I've seen about Tartine bread, I have come to assume that baking using a Dutch Oven concept is key to the lovely visual aspect of this bread. Having paid a cursory glance to the formula, I had a suspicion the flavour aspect of the bread may not be all that strong. Four months seems too long to hold back from posting such lovely work! Shiao-Ping's blog was the first inspiration for Tartine's bread for me, but I actually referered to the original recipe from the book posted on Martha's site (the link in my post above). So the ratio of pre-fermented flour is actually much higher than the original and also the overall fermentaion time is longer, too, because I cold-fermented in the fridge for final proof while the original recipe called for fermenting at room temperature for a few hours. I adjusted my formula that way because I suspected the original method would result in a bread lacking in depth of flavour. I'm not still into the whole Tartine thing, but it was good to try out once anyway. I don't think I'll bake this bread many times, but his use of 50:50 = WW : bread flour to feed starter is now firmly introduced to my feeding method. Not all the time, but it does give me a nice option when I want to change the flavour profile of my regular breads sometimes. So glad to hear you're still enjoying my Faux Poilane. It's really amazing how such a small amount amount of spelt in the mix add extra flavour, isn't it? I have baked his formula quite a few times and have made some alterations as well. I was never happy with the strength of the dough and found it way too extensible so I adjusted the formula to use a stiff starter (wholewheat or white flour) using the same amount of prefermented flour. (this added the necessary strength I like for shaping) I can then give the dough a nice long autolyse without the starter (chad "autolyses" with the liquid starter added) allowing me to bulk ferment the dough an appropriate amount of time without it running away on me. I usually increase the wholegrains to between 20-30% of the total flour ... a bit of rye works wonders. I like the book, I like the story behind it ... I use it for inspiration rather than a manual. Hi, Phil. Thanks for your kind words and input. Interesting to hear the original method produced too extensible dough in your experience. I agree a bit of rye really boosts the flavour of bread, giving a good backdrop for the flavour profile. So does spelt. That's why I often add a tiny amount of rye/spelt to most of my bread recipes.....and been wondering the reason I felt something was lacking in Tartine's bread was because I'm too used to the flavour of rye/spelt-added bread. It's not that I didn't like Tartine's (my take, anyway...). Thought it was very good basic bread.....but not too exciting. I might reduce the ratio of pre-fermented flour next time I make this to see how the flavour changes. I only browsed through pages briefly when Sali kindly showed her copy, but I really thought it was very beautiful book to look at and read CR's life story as a baker. I could see why so many people liked the book. Talking about a baker's life story, have you read 52 Loaves? We spent the weekend away recently and I took away the rye and caraway loaf with us and had a loaf of bread given to us ... woodfired from a local organic bakery ... wasn't great bread :( ... Gotta say when I arrived home I had a slice of my "country bread" toasted. It tasted so good. I had missed it. The fresh milled flours make such a huge difference to the end flavour. I haven't read 52 loaves, but I know of it. It's set in France? I always keep my starter at 70 - 75% hydration, partly because most of the bread I bake is around that hydration level (easy to calculate how much water I need for main dough) and partly because I can't make up my mind whether I like stiff levain or liquid levain. So probably what I make with my starter can be quite different from what an original formula produces with starter of different hydration. It's interesting you've found this bread can be quite demanding. I think I'll have to wait until next summer when it's warm enough to be able to follow the original method to a tee if that's what it requires to produce a decent result. I know what you mean by being disappointed with supposedly good bread made by someone else. When I went to Cambridge the other day, I found a very good artisan baker in the farmer's market was back after a few years absent, so I was so thrilled and bought my all time favourite, Campaillou, from him.......and was so disappointed with the flavour because it wasn't as good as it used to be. The last time I had it was at least 5 - 6 year ago, before breadbaking became my obsession, so it could well be the bread was actually exactly the same as before but my palate'd changed...??? Not sure which. I think your boule is beautiful. Very nice oven spring and bloom, and the crumb is perfect. This bread - and the same goes for Hamelman's Pain au Levain - does not have any strong flavors that grab your attention and make you jump up and down, flapping your hands. It's a subtle bread. The flour mix and techniques coax the pure sweetness from the flour. It does not have an assertive sourdough tang to distract one. In my own bread baking journey, I find myself less intrigued by novelty. I find myself wanting to make fewer exotic breads and returning to the basics. I am delighted still with the tasting of loaves with strong flavors, but many of those loaves don't get eaten. They sit in my freezer waiting for a special craving which infrequently arrives. The Tartine BCB and the Hamelman Pain au Levain are breads I can eat and enjoy every day - as an accompaniment to almost any meal, for a wide variety of sandwiches and as "the main course" for breakfast with cheese or almond butter. They make great croutons and bread crumbs and garlic bread. I don't get tired of them. These two breads are not the only ones I like to keep "in stock," but they are the at the top of my personal list at the moment. Taste is notoriously futile to dispute. I am not disagreeing with yours, just offering another perspective. As I said to Phil above, I tweaked so much in making this bread, so I don't think I can claim the one I made was anything close to what CR's orginal formula would create. But I can see this bread can be a good companion for meals or to be used for sandwiches, as I wrote in OP. Very rounded, mild flavour. It perhaps depends on what sort of role a bread plays in your food life, but for me this kind of levain based large loaf is rarely eaten with a main meal. For that, I'd prefer to have someshing like baguette (or breads with similar dough), ciabatta or focaccia-type bread. This kind of sourdough bread is usually used for breakfast (with butter and jam/marmalade, sometimes toasted) or for lunch (sandwiches) in my household and I prefer to have bread with a bit more character. What I found with this bread was it was something in between; a little more assertive than baguettes/ciabatta sort of bread (almost 100% white flour and poolish-based, never sourdough-based) but too mild than my regular sourdough. So I found it a bit difficult to find where to fit this bread in my meal-pattern. But as I said, mine is perhaps miles away from how the real Tartine's bread should be like, so when the weather gets warmer, I'll try making another, with a formula closer to the original's. Thanks for pulling this one off the PC and sharing your photos (wonderful! ), and for referencing Shiao-Ping's post, whose bread was also very beautiful. I did struggle with extensibility problems when trying Mr. Robertson's semolina version of this bread, so am grateful for Phil's comments above (thanks Phil); I'll try a firm starter when I make it next time. Interesting you had 'extensibility problem' with another of CR's recipe. :p Maybe that's how he likes his dough to be???? I think from what I remember from the book (book in Cambridge, me in London) that he doesn't try for a very flavoured loaf - his starter is very fresh (poolish rather than starter) so he's not looking for the sour / strong taste. I guess a lot of taste comes from the dark crust? I used Shiao-Ping's recipe a couple times when I was in the very early days of learning, and really liked the taste / ability to rise etc! Oh, I see. Then I can understand. Thanks for the additional input. I had exactly the same reaction as you all: a good bread but nothing really distinctive to "grab onto" that makes me want to keep biting (or remembering). I also find it very fickle because of how wet his starters are, so the overall scales end up going against it. It reminded me a lot of the Thom Leonard country loaf in Maggie Glezer's book, even though that uses a different refresh schedule. Thinking more though, my feeling is the problem is that there is no there there due to the white flour. My standard loaf is a desem, which is a conceptually similar bread in some ways (oddly since that uses firm starters and builds, and has less hydration). But they both use the "fresh levain" concept to minimize the sour. My first reaction when I tasted my tartine was: I'd rather be eating my desem. My desem is also very subtle and simple--but that only goes to showcase the amazing flavor of the whole wheat itself without distraction. (The death of desem is "sour".) The first flavors in the tartine bread also recede in the background as if to highlight something amazing that will be on display. But then--after all that buildup--all you get is the generic taste of white flour. Meh! Granted, I used King Arthur and not an artisan sifted local flour, which I have a hunch would make a difference. If I made tartine again I'll probably try retarding for a couple days instead of 12 hours, just to see what it did to the flavor. Or mix more interesting flours (like Forkish's #2 blend? ).